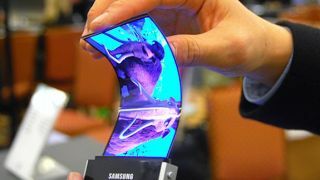 Samsung's first flexible phone to arrive in shape of Galaxy Round this week? But will it be truly unbreakable? It's looking likely that Samsung will jump ahead of LG and announce its rumoured curved display smartphone this week. We've known that it's been coming for some time, and now Korean media source Asiae is reporting that the handset will touch down this week and with the name of the Samsung Galaxy Round, offering a plastic (and therefore more durable) replacement for the glass display. Just the other day, a mystery Samsung device showed up in benchmarking tests under the name of the SM-G910. The Snapdragon 800 processor and Adreno 330 graphics chip of the Samsung Galaxy Note 3 were spotted on the bill. Meanwhile, previous speculation has suggested the handset will have a smaller 5.5-inch display. Rumoured specs for the Galaxy Round are similar to those of the Galaxy Note 3, and there's no clue about pricing. In other words, it's still very much up in the air. LG is also believed to be in the flexible phone race, with the G Flex rumoured to be appearing in November.